Last week, the American Bar Foundation released a Survey of Legal Tech for Non-Lawyers, authored by MacArthur Fellow, Professor Rebecca Sandefur. Sandefur’s exhaustive study identified 322 technology tools for non-lawyers that offer assistance with a range of criminal and civil problems. As shown on the chart, most of the tools serve one of three functions: providing information, connecting users to lawyers or assisting users in producing documents. A few tools help users compile evidence —such as photos of an uninhabitable residence or wage and hour violations — that can be used to support a complaint, and a few others diagnose legal problems or provide a platform for online dispute resolution or crowdfunding for bail or litigation expenses. Sandefur accurately contends that many of these online tools fall short because they fail to help consumers understand that some of their “life problems” (e.g., the rickety stairway and rodents in their apartment building or the below-minimum wages that they’re paid) may also be legal problems. But that’s a blog post for another day. Because even if non-lawyers aren’t yet using many of these online legal tech tools, it’s important for practicing lawyers – particularly solos and smalls – to know about them because they can help lawyers in their practice. How so? Just as many “life problems” may be legal problems, so too, many solo and small firm lawyers must often tell clients that their problem isn’t really a legal problem but instead, an unfortunate fact of life because the matter isn’t cost effective to pursue through legal recourse. Think for example of the client who calls wanting to sue the airline for a refund or file a complaint against the cable company or fight a parking ticket. Doesn’t make sense to pay a lawyer $250/hour to seek a $150 refund. And even for cases involving erroneous credit reports where there’s a potential for attorneys’ fees, the mistake may not be sufficiently grievous to warrant a lawyer pursuing it. Used to be that when these clients called or came in for a free consult, lawyers simply turned them away. But now, lawyers can direct those clients to tools like Credit Swarm which helps users fix mistakes on their credit rating, or Airhelp which assists in recovering refunds for airline delays (see here for last week’s post on Airhelp) or David – which helps resolve disputes with wireless companies. And for clients who want a contract to formalize a small project, they can use forms from Shakelaw or Docracy . In other instances, a lawyer may decline a case because it’s premature for legal intervention or because the client lacks enough information to enable the lawyer to evaluate the case. Or sometimes a case may have merit, but the client simply can’t afford the lawyer’s fee Rather than send the client away empty-handed, in these situations, an attorney can recommend a number of free online legal tech tools to help document a potential case. Department of Labor app helps workers record the hours that they work and calculate the amount owed by their employers. JustFixNYC.com helps tenants document and notify their landlord of repair issues by certified mail – which creates a record if further legal action is needed. Legal Logs offers a way to store texts and receipts and gather evidence for custody and divorce cases. And Legal Equalizer is an app that allows users to start recording and capture a police stop on video and audio on their phones. Once clients have gathered information, they have so many more options including self-help (which will be more effective with the right information) or unbundled or low-cost legal services which an attorney may be more likely to provide when the client has done much of the legwork. In some instances, the law doesn’t go far enough to help clients with everything they need – and some of the online tech tools fill the gap. For example, criminal defense attorneys can argue for a judge to set lower bail – but if bail is too high, here’s nothing more they can do legally. But Better Bail is an app that helps users shop around for bail bond quotes so that a client may be able to find something affordable. When lawyers draft wills and trusts, they’re paid to include all the legal lingo – but clients may want to store and pass on advice to beneficiaries. Or they may be confused about their end of life wishes for care. It’s not economically efficient for lawyers to spend hours counseling clients on these issues or drafting even more documents – but an app like Cake – helps users create profiles of their end of life wishes and store them securely. Fair Split offers free tools to inventory items for divorces or estate assets and online tools for dividing them up (note: the online tools range between $179 and $689- but still cheaper than oversight by a lawyer). Finally, some clients simply can’t afford a lawyer’s fees, or may contact a lawyer with a problem that the lawyer lacks the expertise to handle. 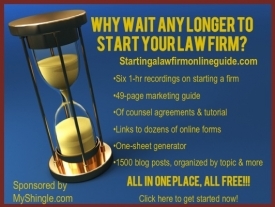 Not surprisingly, online tools for finding a lawyer abound ranging from referrals to private lawyers through Court Buddy (offering lower fixed fees) and Separate Us (referral to divorce lawyers) to legal aid organizations. Though many life solution problems may have legal solutions, as those of us who have been practicing law are aware, the law also has its limits. As lawyers, many of us try to leave our clients better off than when we found them by helping them to address their non-legal issues or to reform the law where the legal remedies were inadequate. Many legal futurists, looking for a whipping boy, persist in contending that that it’s lawyers who block the development of tech tools that could help clients handle their own problems. Not so. Though regulators may take issue with technology, we who actually practice law recognize that the 322 non-lawyer tech tools and the others that continue to emerge enable us lawyers to help those clients whom we’d previously had no choice but to send away empty-handed. And that’s a good thing.